After a successful day in court yesterday, the E15 Open House on Carpenter’s Estate remains open until Tuesday 7th October. 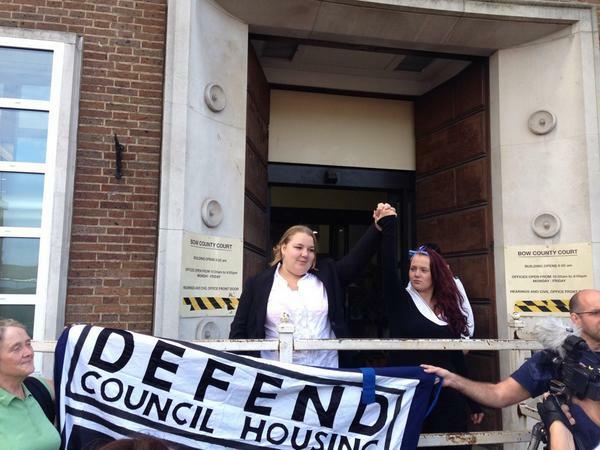 Below is the statement that read out by Jasmine Stone and Sam Middleton yesterday after Newham Council dropped their legal action against their two week political occupation of a boarded up house on the Carpenter’s Estate. ” We are overwhelmed and grateful for the support and solidarity from both the local and the wider community. Also thank you to Anthony Gold, ITN solicitors and our barrister Lyndsey Johnson. We have decided to leave 80-86 Doran Walk on our own terms by 7th October, as planned. Newham have agreed to this, with no other conditions and have dropped their Interim Possession Order. We have celebrated a year of the E15 campaign, during which we have tried to engage with Newham Council on a number of occasions and they have refused to listen. As a result, our political occupation was the only option to escalate our demands for social housing, not social cleansing. We have reached our goal of highlighting the issue of decent homes left empty on the state and we have built lasing link with the residents and the community. This has been broadcast to millions of people.